By combining creativity with dependency, you might think we would come up with a sort of brilliant layabout genius. Yet Scorpios born in Goat years are busily inventive and perhaps the least lazy of all Goat subjects. Nonetheless, Scorpio Goats tend to live off the endeavors of others. By this, I certainly don’t mean that they refuse to work on their own. Far from it. But their choice of work is invariably dependent on a structure coming from without. They are not disciplined people and should not attempt to be. They simply must recognize that their genius overrides their need for order. Then, they can set about getting their lives structured by outside forces. This force can take the form of a marriage, a business, a child or two, a project, a course of study or even a lover or mistress. But whatever the structure, you can be certain it does not come from within the scatty Scorpio Goat himself / herself. Inside, the Scorpio Goat/Ram is a roiling cauldron of invention, new ideas, schemes, plans and dreams—some of them realizable and many of them totally off-the-wall useless. 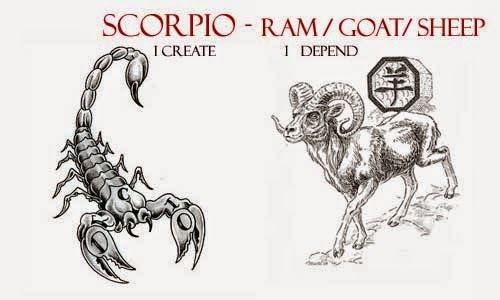 You see, the Scorpio Goat/Ram is the opposite of practical. He is eccentric and erratic. He has spurts of genius and is truly gifted for artistic endeavor. But he is also hyperidealistic about his projects. He wants his plans followed (by others of course) to the letter. He operates largely for the sake of his own gain. He wants the glory and the returns. This makes him, despite his good intentions, an unwitting user. Scorpio Goat/ Sheep are interested in absolutely everything. They like to be aware of all news and up to date on styles, and they follow the careers of new artists with zeal. They are even a tiny bit snobbish intellectually, and they are blatant know-it-alls. There is no subject upon which this person will not attempt to expound. “Do you know why the traffic pattern in Schiphol Airport was altered?” Nope. “Because the people who come to Holland from Malaysia . . .” and on and on. You don’t have to talk at all in tête-à-têtes with Scorpio Sheeps. Just sit there with your ears open. They’ll tell you everything you need to know, and then some. head-on collision rather than lollygagging or dithering on about which direction to take. Too, under the guise of expansive generosity, adopting poor relations, and jettisoning silver dollars at bums on the street, these people are avid for the last penny in transactions of all sorts. They like to think of themselves as philanthropic. But they are actually quite unashamedly miserly. The beauty of Scorpio Goat is his or her rainbow of curiosity. This person wants to know how to play the piano and dance the tango, ride horses and program computers. She’s earnestly attracted to cultural events and enjoys great talent of her own. If she can find the necessary structure, her innumerable talents can blossom. Without it, she may become dissipated and disillusioned. John can run rings around you and me—move that piano, tote that barge, lift that bale—but Scorpio Sheep likes us to think otherwise. If you love one of these people, get ready for a lifelong struggle. Scorpio Sheep like nothing better than a good fight. They are strong-willed and quite unabashedly selfish. They are, however, fascinating, interesting, and extremely faithful to their partners. You win some, you lose some. The interior of the Scorpio Ram household is often impressive. These folks love beautiful things and do not disdain luxury. Their homes will be cleverly decorated and just a tad bohemian or artsy. They are not much in the kitchen, so that area may be naked. But check out the pile of art magazines on the hand-hewn coffee table, the little Giacometti in the corner, that Picasso etching over the harpsichord. Bliss, n’estce pas? Parenting is something these people claim to be very interested in. I’ve never been so sure. They definitely require the affection they get from children and they also enjoy returning same. But they are not really very wise about their kids’ tricks. They let themselves (and their guests) be walked over by Junior’s robot tanks and Sissy’s performing hamsters. It’s quite a mess in the kids’ rooms and Dad or Mom Scorpio Ram would even like it to be a bit worse, if you please. They are cheerful parents. But indulgent. Scorpio Ram kids are smashingly cute. They love being the only child. They like to be taught new things and be taken on trips and to museums and the like by adults. In fact, they thrive on adult attention and make terrific little companions for maiden aunts. These children require occasional rigor to prevent spoiling. With the proper education and the right dose of discipline as a child, this person can train for a serious profession like sculpture or medicine or film editing or direction or creative writing, or more than one of those. The touche-à-tout aspect of the Scorpio Goat character can be a giant trump card. But getting him or her to stick to one art long enough to make anything of it is the problem. They function well in office situations as long as they get all the attention and can innovate their heads off. As a boss, this person will be lovable, and most often bankrupt—or at least he says he is. I have always noticed that Scorpio Goats hide their wealth from their employees. So expect to enjoy working for a Scorpio Goat, but don’t expect to get rich doing so. As employees, Scorpio Goats work hard (even round the clock if necessary) in an erratic kind of way. They get the job done. They want lots of praise. Some good career choices for Scorpio Goats are: singer, poet, commercial artist, painter, sculptor, interior decorator, movie director, hairdresser, dance instructor, psychologist, plastic surgeon or jazz musician.